The Argentine monetary policy focuses on monetary stability, i.e. price stability, the remaining objectives being achieved through more specific instruments. The BCRA promotes monetary stability by fostering a systematic and sustainable decrease in the inflation rate, which is expected to go down to 5% annually in 2022. In order to achieve this objective, the BCRA decided to use inflation targeting in 2016. Within the framework of this regime, it conducts monetary policy to reach the inflation targets set in conjunction with the Ministry of Economy. The BCRA is functionally independent, in other words, it is vested with authority to opt for the monetary policy instruments it may deem appropriate. Moreover, the BCRA shows a high degree of transparency by making available to the public its outlook and measures. It is further accountable to society for the fulfillment of its objectives. The first three targets are included in the program signed with the International Monetary Fund (IMF). 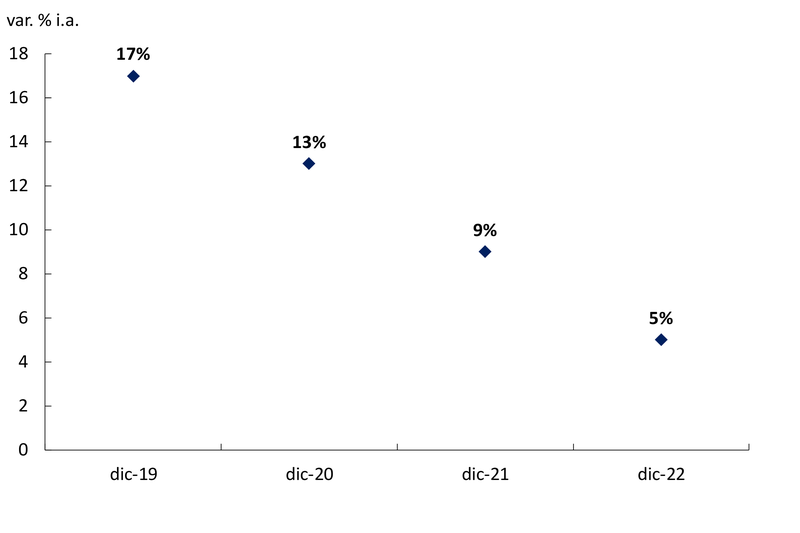 The BCRA's monetary policy mainly relies on the short-term interest rate. In search of increased effectiveness, the monetary policy rate has been changing over time. On August 7th, 2018, the Monetary Policy Council decided that the benchmark rate would be the rate on liquidity bills (LELIQs). The monetary policy rate shows the bias adopted by the BCRA to reach its inflation targets. In the face of high volatility, the BCRA will play an active role in the secondary market of LEBACs with a view to giving the right signals about its monetary policy and, if necessary, it will take other decisions about the monetary policy rate. The BCRA's monetary policy rate is set based on a series of economic variables that affect current and future prices. Some of these variables include the evolution of retail prices, inflation expectations, the economic cycle, the evolution of wholesale prices and monetary aggregates. Within this monetary regime where the BCRA sets the short-term interest rate, market forces play out in a floating exchange rate system. Anyway, the BCRA may operate in the foreign exchange market to strengthen its balance sheet and in the event of disruptive fluctuations. The Board of the BCRA has created the Monetary Policy Council (COPOM) which is composed of the Governor, the Deputy Governor, a board member appointed by the Board and the Economic Research Deputy General Manager. The Council is now entrusted with powers to adopt resolutions. The COPOM’s main duty is to determine the benchmark rate; the rates on repo transactions and instruments issued by the BCRA; as well as the terms and other requirements for implementing the monetary policy. In this regard, the COPOM will also set the cut-off rate on Central Bank Bills (LEBACs). The initial COPOM will be composed of the following members: Luis Caputo, Governor; Gustavo Cañonero, Deputy Governor; Enrique Szewach, Board Member; and Mauro Alessandro, Monetary Policy Strategy and Communication Senior Manager, who will act as a provisional member until the position of Economic Research Deputy General Manager is filled. The Governor shall have the casting vote in case of tie. The COPOM will meet on the second Tuesday of every month to discuss the monetary policy rate and on the third Tuesday of every month to set the cut-off rate on LEBACs. 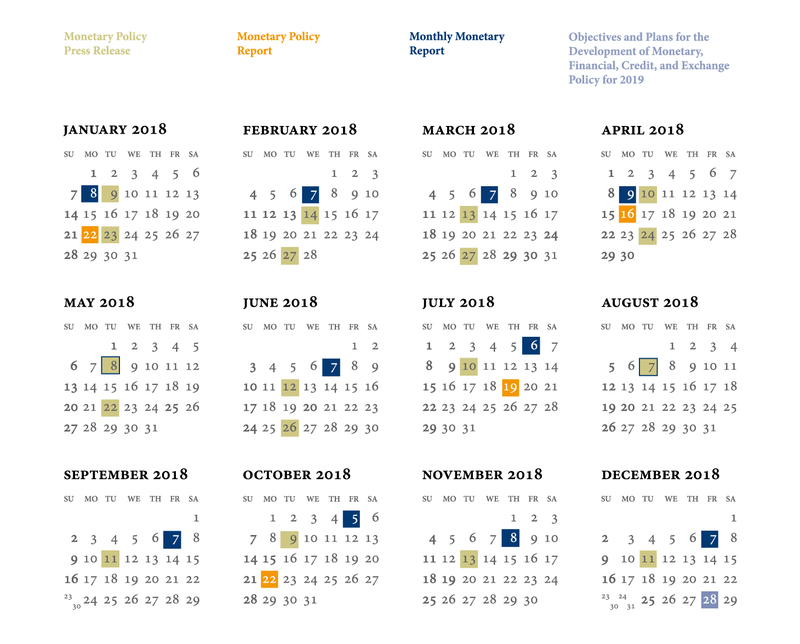 The COPOM is expected to inform the monetary policy rate on the second Tuesday of every month at 5.00 p.m.
- Monetary Policy Release | This is a monthly release that describes the BCRA’s decisions about its monetary policy rate. - Monthly Monetary Report | This report describes the evolution of the main monetary variables. - Monetary Policy Report | This is a quarterly publication that unfolds the BCRA's outlook on its monetary policy in terms of the evolution of the economy and prices. In Argentina, inflation has been historically associated with the financial assistance granted by the BCRA to the Treasury; however, such assistance had been on the decrease since 2016, finally coming to an end on June 7, 2018 in fulfillment of the commitments taken under the program agreed upon with the IMF. In the future, the BCRA may only transfer realized profits to the Treasury once its capital has reached an appropriate level. In turn, the Treasury will buy back non-transferable bills from the BCRA at specified times in a gradual manner. The removal of financial assistance to the Treasury and the repurchase of non-transferrable bills are meant to bring about a significant reduction in the stock of LEBACs, thus strengthening the BCRA’s operational capacity to reach its monetary policy objectives.